I am so grateful that it is June already. I love the warm weather, the greenery, and the flowers blooming. There is always so much to look forward to in the summer. Things are more open, laid bare, no blankets of snow covering it up. And my bare feet will be permanently dirty until November. But this post should really be titled "I love a good mystery" because mysteries abound. First there are the neighbors who were whisked away one night after an enormous black touring bus pulled up in front of their house. A man in a suit stepped out to greet them while a television crew filmed the encounter. Shouts of "Congratulations!" filled that air, as the couple boarded the bus and departed. The next day, their house was cleaned out, furniture with signs that said "FREE TAKE ME" lined the driveway, and a "FOR SALE" sign sat on the front lawn. Now, we have no idea what that was about, but obviously it was BIG. Then, there is this mysterious package that my cousin has been planning to send me. He said it includes many important family documents and a few other things. What could it possibly contain? Oh, and less romantic is the dead squirrel I encountered in the front yard this morning. What happened to it? How did it get there? I left a note for the Mister to draw his attention to it. I was hoping he would contact me immediately with a theory for the squirrel's demise, but all he said was that he moved it. Well, better him than me. These are the heirloom variety peas we grew, just to see what they are like. 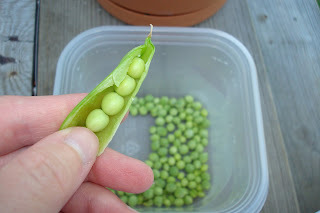 They are smaller and crisper than conventional peas, but the sweetest I have ever tasted. Perfect for all the salads we have been enjoying. I don't know how old this variety is, but they could easily be the peas that your great-grandparents grew. At the logging expo, the Mister took a class on Shiitake mushroom growing. It was something he tried once before, but dropped the ball on. It involves filling a log full of holes with some sort of spore and then sealing it with wax, waiting a year, and then dunking the whole thing in water. We'll see. In the Kitchen: Lots of fresh salads with lettuce and spinach, and strawberry rhubarb pie. The latter, as Twila pointed out, is almost impossible to pull off with your own garden harvest since rhubarb is done right as strawberries are just starting. But they sure do taste good together. Also, getting ready to can cherries. Thinking About: Our trip to Ohio next month and what we should see and do. Ideas are welcome! We'll be in Holmes/Wayne/Tusc etc. Those peas look good enugh to eat. LOL Yummo!! I too, love June for some reason. It is summer but still not blistering heat yet. July and August on the other hand I am not looking forward too. Did you take any of the Free Take Me furniture? I wonder if they won some lottery or something. Eew a dead squirrel. Must be related to the dead birds around here. Your trip to Ohio sounds fun - I wish I were going!! We're heading out in a couple weeks to Arcola/Arthur, IL. It's just a couple hours from here so that should be relaxing - if I don't receive any panic phone calls from home from the kids! Do you have family in Ohio or are you going as a tourist? I remember my Mom talking about saving pea seeds before there were hybirds. Every pea season the neighborhood women would compare their peas and then decided which neighbor's seeds they want to try next Spring and asked her to save some seeds. The deciding factor was usually the taste of the peas.